Reinhard and Felt are just side characters in the Re:ZERO anime. While they did play a crucial role in the first three episodes, they pretty much vanished from the story altogether after that point. So why did I end up liking them so much? Because in any other fantasy story, they would be the main characters. Felt is an orphan, who manages to survive on the streets by becoming a thief. But through a twist of fate, the Dragon (basically the deity of the Re:ZERO universe) identifies her as one of the possible candidates for the throne. On top of that, she strongly resembles the Lugunica royal family with her distinctive blonde hair and red eyes. Given that the royal family died because of a mysterious illness, what can explain Felt’s existence? 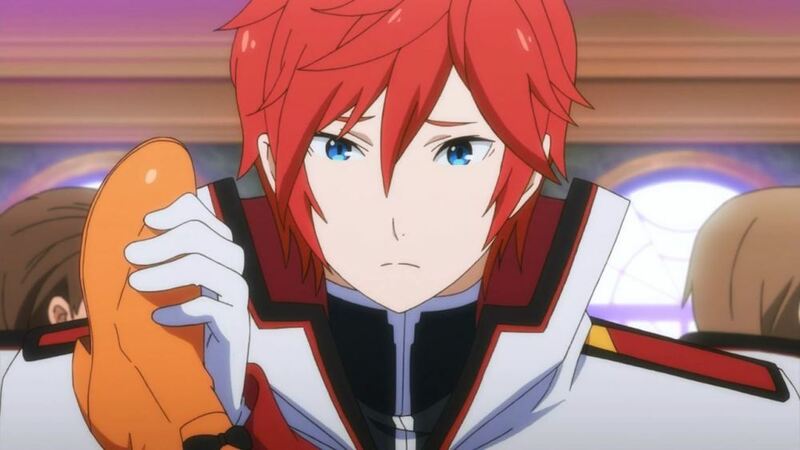 Meanwhile, Reinhard van Astrea is indisputably the most powerful character in the Re:ZERO universe. His past is shrouded in mystery, and he appears to have a complicated family situation. When he discovers that Felt is a candidate for the throne, he immediately decides to become her knight, whether she likes it or not. For all his inexplicable actions, he comes across as an extremely nice guy who is fighting on the side of “good”. Any other fantasy story would revolve around Felt’s backstory and her connection to the throne, but instead her goal of revolution is presented as a side show. 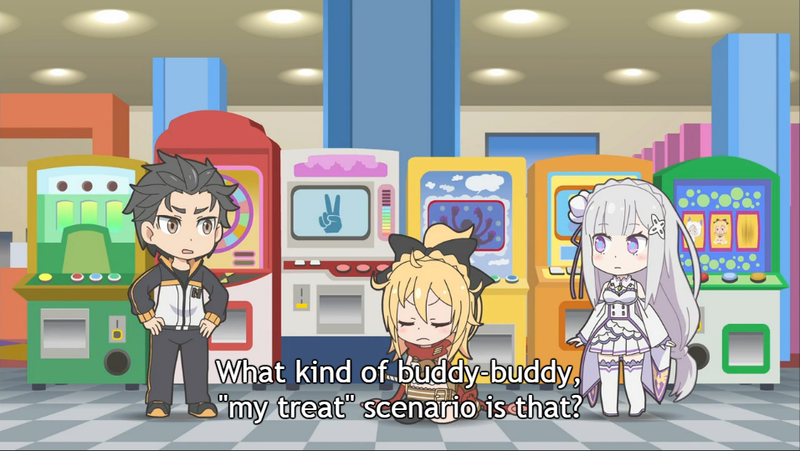 Even when Felt and Reinhard’s story becomes a bigger focus in the overall plot of Re:ZERO, these developments will most likely be framed through Subaru’s point of view. Had the story been told through Felt and Reinhard’s perspective, I would have thought of them as archetypal characters, but here they’re refreshing. It just goes to show that even “the main characters” of one story are just part of a bigger world. Given that even Subaru, the story’s point-of-view character, has to learn the hard way that the world doesn’t revolve around him, the narrative’s treatment of Felt and Reinhard makes particular sense. In other words, everyone is a main character in Re:ZERO when you look at things through their perspective. That’s why I spent a lot of time thinking about Felt and Reinhard and that funny dynamic they share. I think their interactions are really cute. Felt is an independent-minded girl and hates the nobility, but she doesn’t mind relying on Reinhard to achieve what she wants, even though he technically kidnapped her. Reinhard is so charming and well-loved that even Felt can’t bring herself to dislike him, although she does get huffy and try to kick him around in a tsundere-ish fashion. Meanwhile, Reinhard just blocks her kicks effortlessly. Poor Felt can never teach him a lesson! I also think it’s adorable how Reinhard lectures Felt about how to be a lady and even picks out her dresses for her. Apparently, he even has the ability to pick out the best dresses. He’s the most powerful guy in the world, but as a knight he serves Felt in the most mundane of ways. The gap moe is strong with these two. Did you know I was so obsessed with Felt and Reinhard that I even drew fanart and wrote fanfiction about them? Please tell me I’m not the only one who loved these two characters to bits. 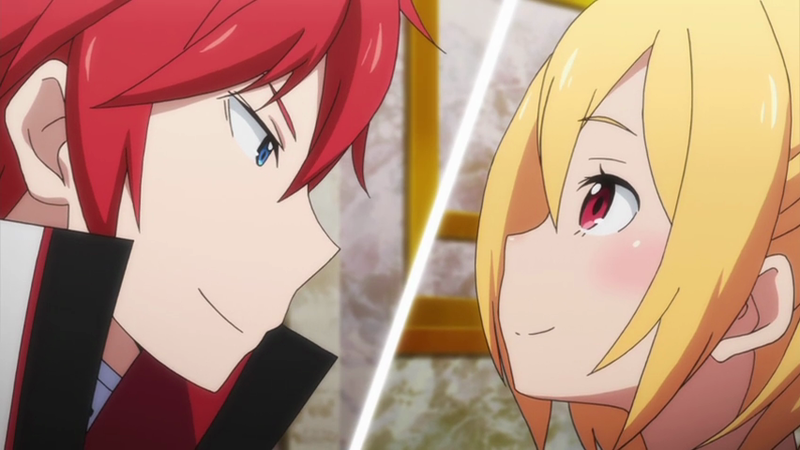 Posted on December 18, 2016, in Pairings and Shipping and tagged 12 days of anime, i watch rezero mainly for reinhard and felt, re zero, reinhard is such a hunk, reinhard x felt, yahari ore no seishun love come wa machigatteiru. Bookmark the permalink. 18 Comments. Damn bruh you need to chill. But I I can’t blame ya at all. When Reinhard’s first (and I think only) fight scene came up I was freaking out by his utter badassary alone (only the best choice of words). There was something about the secondary characters in this show that just made my day. Reinhard along with Julius, Felix, and especially Willhelm were in my opinion the best characters in the show. I thought Felt was cute too, but if there’s a pillow of Willhelm out there next to a Felt pillow, I’ve made up my mind. And don’t judge ME!!!! You are not alone, I have dropped Re:Zero, but I would come back for their own story. He comes across as an “extremely nice guy who is fighting on the side of ‘good'”? Maybe. My first impression was that Reinhard’s this show’s kitsune character. That doesn’t rule out anything you said here, but you trust him at your own risk. I might support the ship if the show had given Felt better cards. As it is, I don’t think they’re even playing the same game, and only Reinhard knows the rules (or so he thinks). It’s entertaining, though. I think Reinhard’s fighting for a greater good, or at least he’s not self-serving. His loyalty is for the Lugunica royal family, which is why he seems pretty cool with the idea of Felt destroying for everything. He had to manipulate things in order for Felt to become his master, but now he would never betray her. Well, that’s how I interpret their dynamic, at least. I’m not sure how much you know about the story, but it’s proabably more than me: I’m anime only. For what it’s worth, your impression aligns with mine. Our differences are probably in outlook. I find a “greater good” to be suspicious. You have to know what you’re fighting for, but if it’s something as abstract as a “greater good”, you get to call what’s “greater” and what’s “good”, and that’s ultimately self serving. So you then talk about “had to” manipulate things, but he didn’t have to, really. He could have “sucked it up” and let her go her way, which is what people with little power do all the time. So when you then go for “would never betray her”, then it feels a little hollow to me. If she does something against the “greater good”, he’ll “have to” manipulate “a little” again, and that’s not betrayal, because what he thinks she should be is her “true” self, right? Because it’s always the idealists who know. Seriously, I like Reinhard, but I’d like to see Felt kick down the fundement of his ideals. It’s the only way they can ever meet as equals: when they both have to make their living in the metaphorical ruins. No, I hear you. All those things were going through my head when I wrote my fanfiction lol. In my head, Felt tried to escape from Reinhard after the events of episode 3, and then realises that she has no place to go back to. And besides, wasn’t it always her dream to leave the slums and live in luxury? She struggles with things like that, and eventually decides to stick with Reinhard for now, just to see what will happen. As I almost never engage in shipping, I’m curious: What is shipping about to you? They’ll be happy together? They’ll be entertaining to watch? They represent some sort of coupling ideal? Mostly being entertaining to watch. Thanks. In that case, I can support the ship. Heh. But I read your fanfiction, and I really really like it (in my defense, I’ve been deprived of these beautiful characters for far too long) Do you plan on continuing it? Thanks! 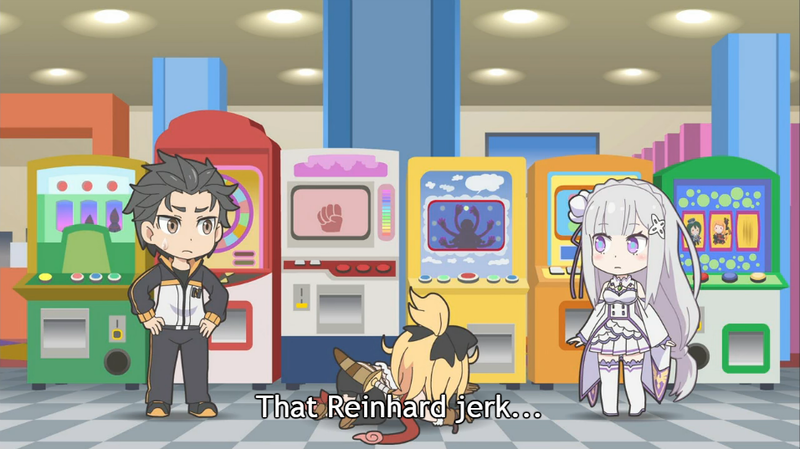 Tbh i kinda dropped rezero mid season when it aired because short attention spans lol – but when i saw the LN cover of felt and reinhard my inner fangirl turned on and I picked up rezero again only to find out reinhard is now felt’s knight and she may be the only living survivor of the royal family. By the way, i love your fanfiction to bits and would love to read chapter 3 – dramatic entrance and saves the day like a boss!